Restore good gut health after a course of antibiotics with the help of Pro-Intensive. This high potency blend of live bacteria helps maintain good gut flora, which can become unbalanced after an illness or a course of antibiotics. Each of the four strains of bacteria in Pro-Intensive, Lactobacillus acidophilus, Lactobacillus casei, Bifidobacterium lactis and Bifidobacterium bifidum, work harmoniously to support the natural environment of the gut, resisting stomach acid and bile salts to reach the colon alive for maximum efficacy. In the order of 9 billion viable organisms, at time of manufacture. Lactobacillus acidophilus, Lactobacillus casei, Bifidobacterium lactis, Bifidobacterium bifidum. 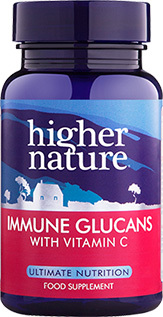 Take 1-3 capsules a day, with a glass of water immediately before a meal. 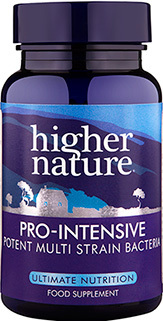 Not being myself for a long time, plus having a baby, problems with concentration and overall discomfort - Probio Intensive along with vitamin B6 put me back on my feet - I feel amazing and I would also highly recommend this to anyone. I have recently started taking these having suffered with a lot of pain and bloating following meals for a long time. Probio-Intensive has given almost immediate relief! I feel so good! Would definitely recommend! Only downside is that they need refridgeration, which is a bit awkward for eating out and about. I started taking this product less than two weeks ago for my long term IBS. Within a week, I began feeling less bloated! 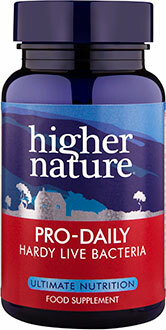 Previously, I was taking aloe vera juice and Higher Nature's probio daily. I would recommend this to anyone with IBS, which I have been doing. 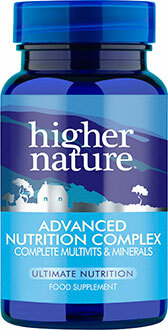 Along with a big change in diet, these supplements helped to clear a long standing candida overgrowth. 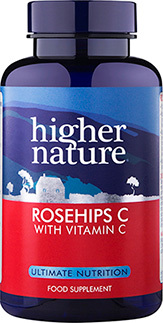 I would highly recommend this product to anyone with similar issues.